No Allison this weekend - she was wrapped up in festive family stuff. That meant that I could get away on Thursday morning, so the range / hill option choice was expanded. Thursday was also my last ever day at work: although I retired in Feb 2017, I continued to work a few mornings per week doing part of my old job. For a variety of reasons I had decided that I wanted to stop working completely - I'd originally intended to finish up on Hogmanay, but I decided at the start of this week that Thursday would be my swansong, using holidays I had accrued to make it happen. Perhaps took my colleagues by surprise. So in a way it was maybe a good thing that I was to be on my own for the weekend - plenty of time to ruminate over my career. As it happens, I had started my job as a consultant the day before the summer solstice of 1995, so there was some poetry in my concluding the day before the winter solstice. I had decided to drive up the Northwest - a goodish forecast at the beginning of the week had been gradually eroded as the days went by, but it didn't look bad. The Beinn Dearg 4 would provide sport for Friday, whilst Conival & Ben More Assynt would be done on Saturday, and a quick lope up Cul Mor before heading home on Sunday. That was the plan. I left Greenock around 11am having said my farewells at work and arrived at Inverlael around 3.30pm. 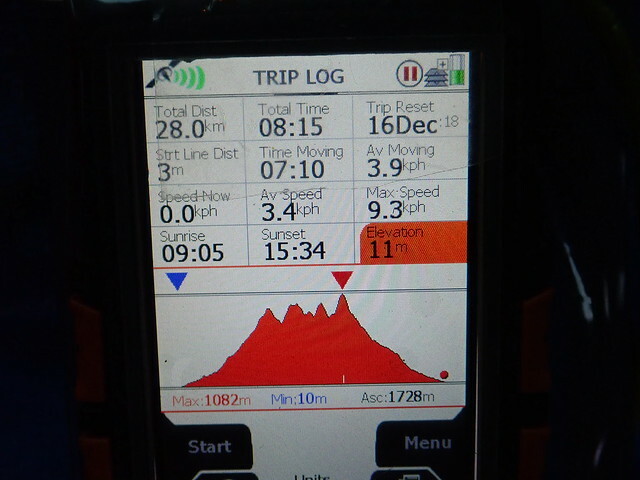 I thought I'd take the tent a few km into the route leaving me with a more manageable distance the following day. 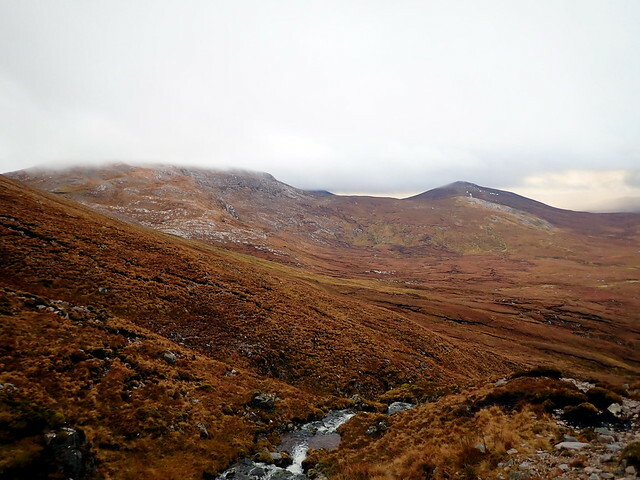 I wasn't sure how long the four mountains would take - previously I've done the hills along with Seana Bhraigh, which adds on another fair bit (especially if Simms are included). The twilight was already gloomy by the time I got to the edge of the forestry - although this was only a mere 3.5km in I was dubious (and rightly so) that I'd find a place to camp beyond this and pitched just before the end of the trees. Plenty of time to read: I finished off John Williams' fine novel "Stoner" - an interesting read when you are in the process of appraising your life. Bright moon, almost full, lit up the trees from around 7pm, no noise except the distant splashing of the river away through the trees. I reckoned I'd better start off before first light, so roused myself from my warm nest about 7 and was ready to set off by 7.45. I haven't used a headtorch in the morning before - it was unusual to see the light increase around you rather than diminish as the time went on. From what I could see there wasn't much snow about, but the mountains were mostly hidden under cloud. I'd not approached the hills from this side before, having reached Eididh nan Clach Geala from Toman Coinich previously, so climbing up the stalker's path into An Cnapach was a new experience. 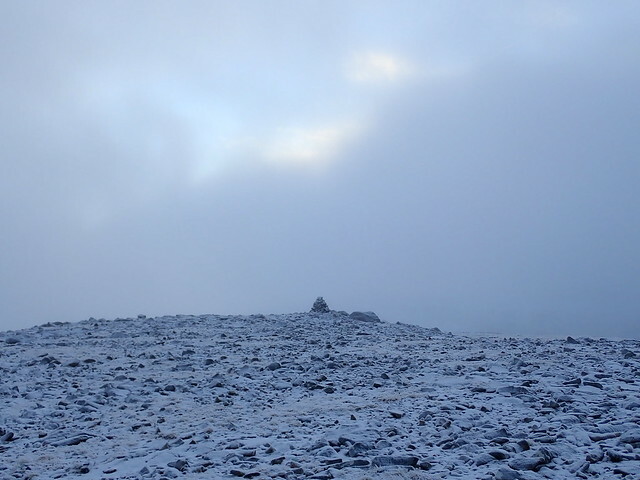 There might not be snow, but it began to get very icy underfoot from about 650m. On the plus side, this meant the bogs were frozen. 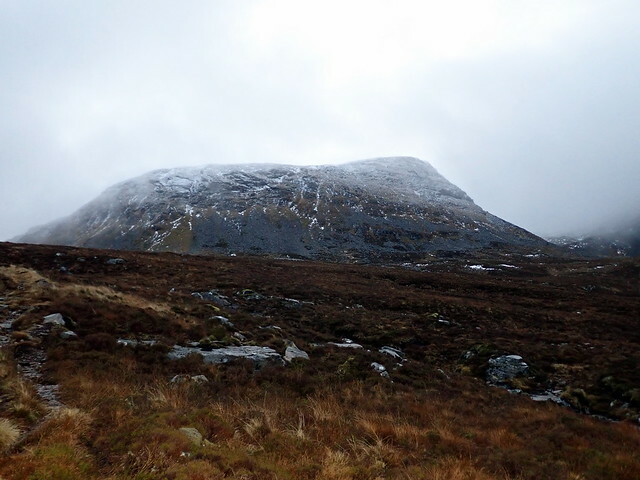 I could see Eididh nan Clach Geala rising up like the breastplate of its namesake ahead of me, a few streaks of snow down her flanks and the rounded summit dusted like sugar on a dumpling. 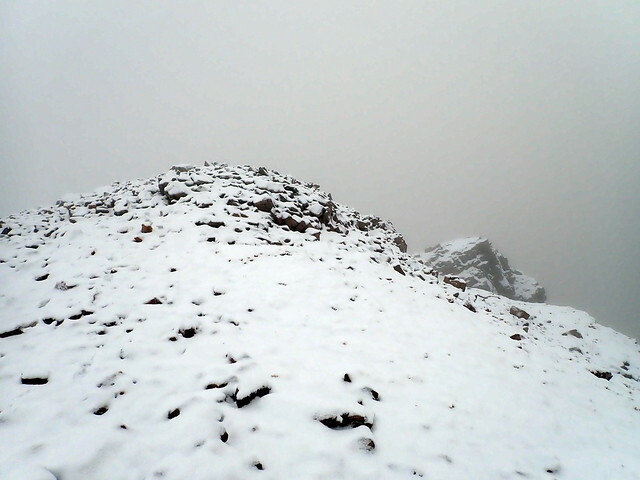 I followed the path up to the top, round a couple of craggy bits before arriving at the cairn. Hopes that the cloud might lift enough for some views were dashed. 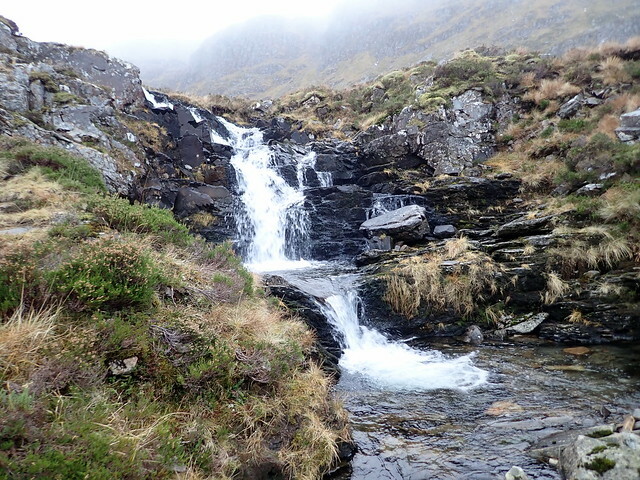 Onwards to Meall nan Ceapraichean - this was familiar territory dropping down to the small lochans then up to Ceann Garbh. 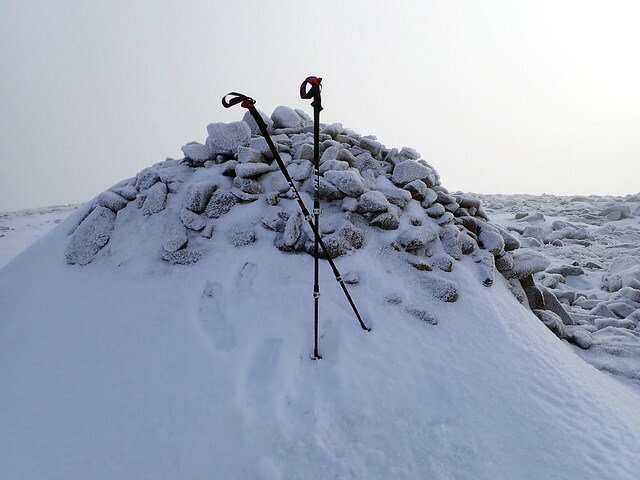 I encountered a steepish slope climbing to Ceann Garbh which made me affix may crampons halfway up (never the most sensible place to put them on, I know) as the snow underfoot was firm and unyielding. 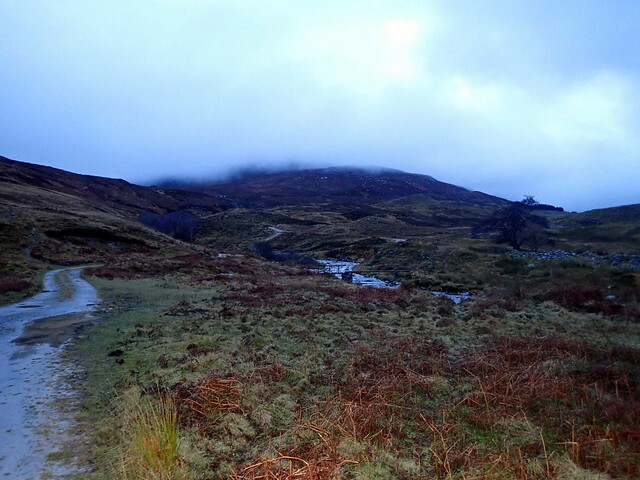 Round to Ceapraichean, where there was little snow then down into Bealach an Lochain Uaine. Clag was obscuring both Cona'Mheall and Beinn Dearg. I decided to leave my rather heavy rucksack behind and ascend Cona'Mheall unladen - third time I've climbed this hill sackless. At the summit it looked as though the sun was going to burst through its confining clouds and I anticipated a nice Brocken Spectre when it did so, but although it shone quite brightly, it was still trapped behind a haze. I retraced my steps to my rucksack. I paused for something to eat, quite pleased with the time I was making. Beinn Dearg was next and I had thoughts of continuing on to the Simm of Creag a'Choire Ghranda to the SE of Dearg's summit. 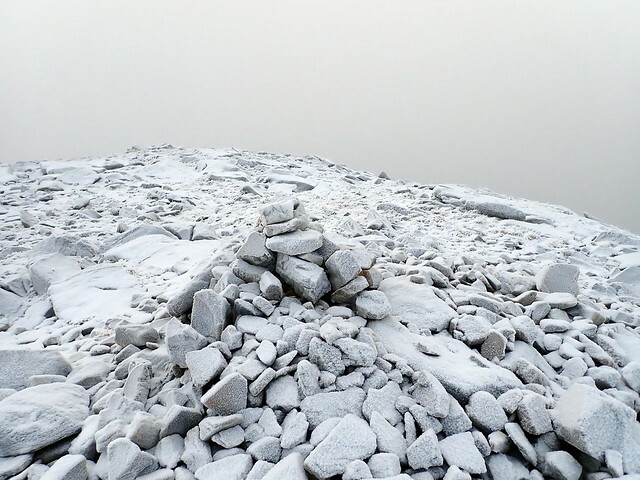 This was too far to travel (in my eyes) whilst leaving a rucksack behind, so I lugged my sack up to the icy summit of Dearg. I could have left it there - but although I was doing OK for time I decided not to head down for the Simm - it would have been a full 300m descent/re-ascent involved and I couldn't see where I was going. A little voice in my head said "nope", so it will be on the menu the next time I'm up here with Allison (lucky lady ). 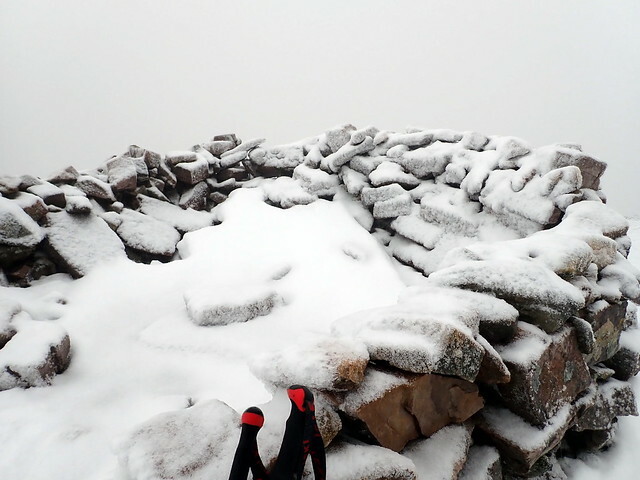 It was then just a matter of climbing back down Beinn Dearg to the path out: I put my crampons back on for this which meant I could walk in the frozen snow along the wall rather than clamber through the boulders. Onto the track and an uneventful walk out, reaching the car just after 3pm, still plenty of light about. 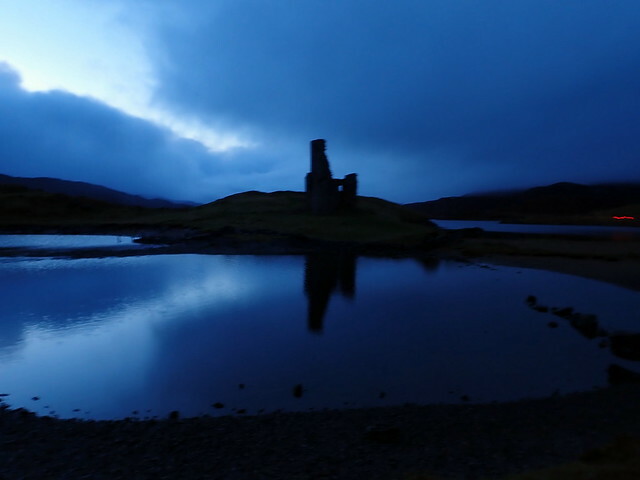 I decided to drive up towards Inchnadamph - I thought I'd camp by Ardvreck Castle. 30 miles there, sadly the clag was down covering some of my favourite mountains - light was fading and rain was threatening as I got to the parking area and gathered my stuff together. Found a nice flat area overlooking the ruined castle and set up home for the night. Gobbled up my evening meal, a coffee and some chocolate then tucked myself into bed and started reading Gavin Maxwell's rather bloodthirsty account of his doomed basking shark hunting venture. 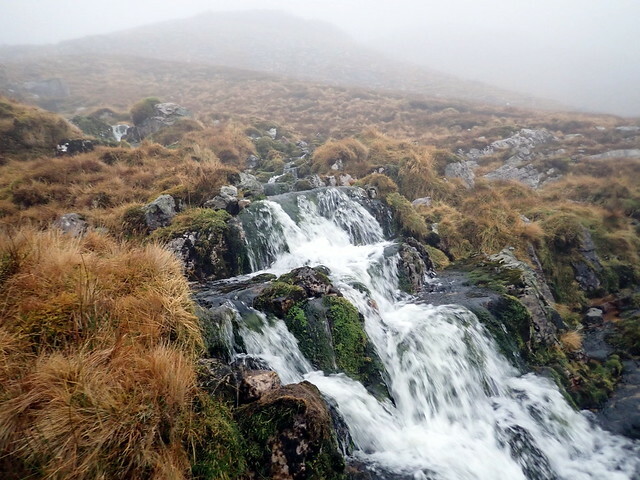 The rain came on quite persistently through the night, although it didn't feel cold, and I suspected the rain would be washing away any remaining snow on the hilltops. As Conival / Ben More Assynt was a shorter day, I saw no reason to get up before it was light. 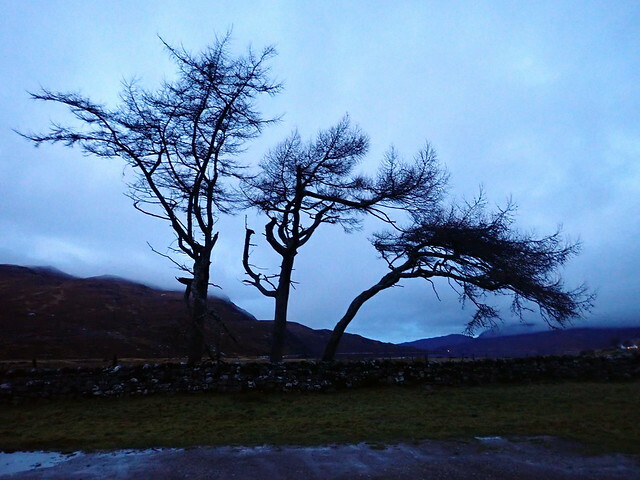 The rain seemed to have abated as I packed my tent away and drove along to the parking area by the Hostel. Setting off at 8.45 with a lighter day sack, it really did feel quite mild. 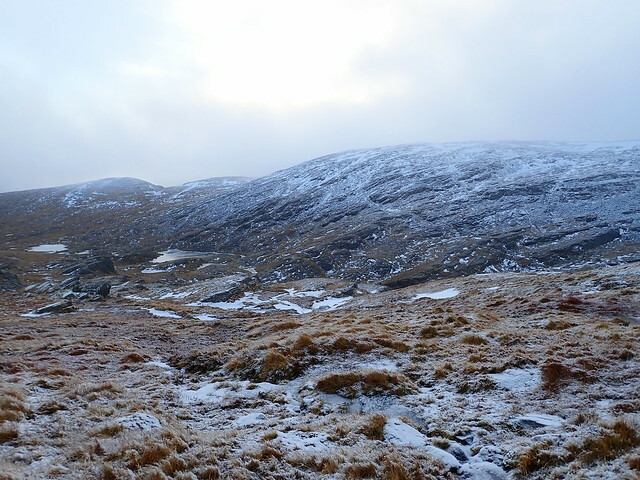 Once again the hilltops were under cloud and the extensive bogs along the path to Conival were most certainly not frozen. I saw the prints of a couple of people ahead of me in the mud. They must've started early as there was no sign of them ahead. 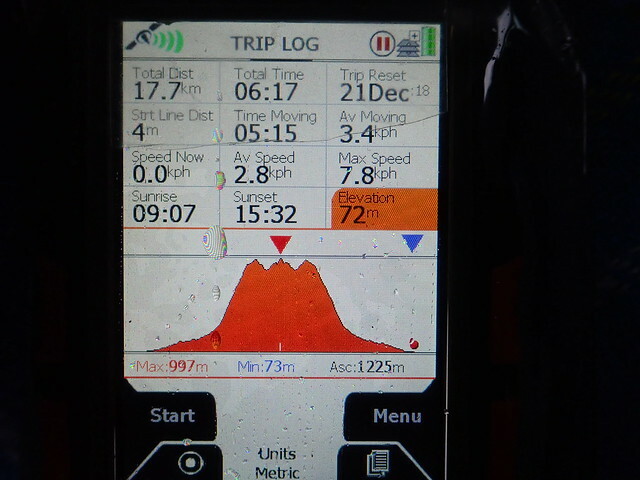 I'd semi-forgotten what a steep slog it is up to Conival, continual ascent without rest. At one point I stopped to take off my waterproof jacket, as I was roasting, but no sooner had I packed it away than the rain came on. 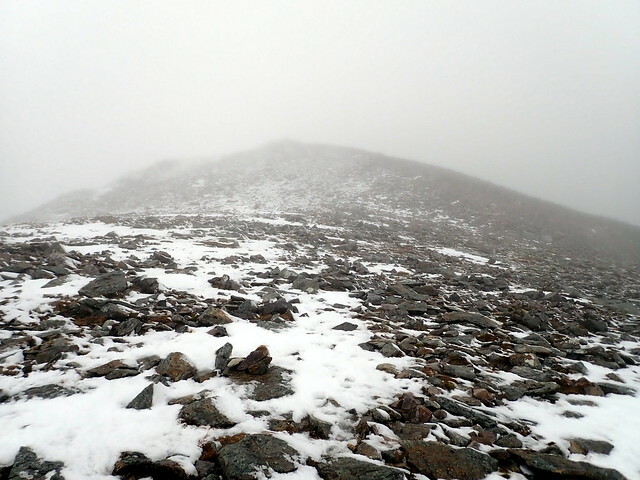 As I clambered up the scree and boulders towards Conival there was a chill breeze which helped cool me down. 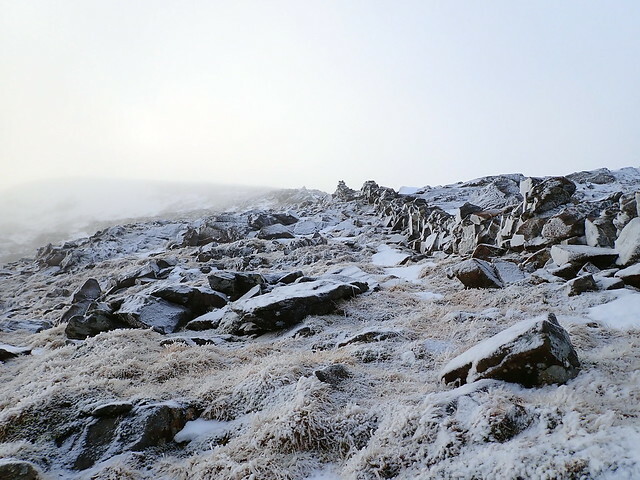 Visibility hadn't improved and by the time I reached the windshelter at the summit it was clear that last night's rain had indeed fallen as snow up here - there were 2-3 inches of soft slippy new snow underfoot. This made for some slithery moments on the walk across to Ben More Assynt - I finally caught up with the other walkers, two ladies and their lurcher. 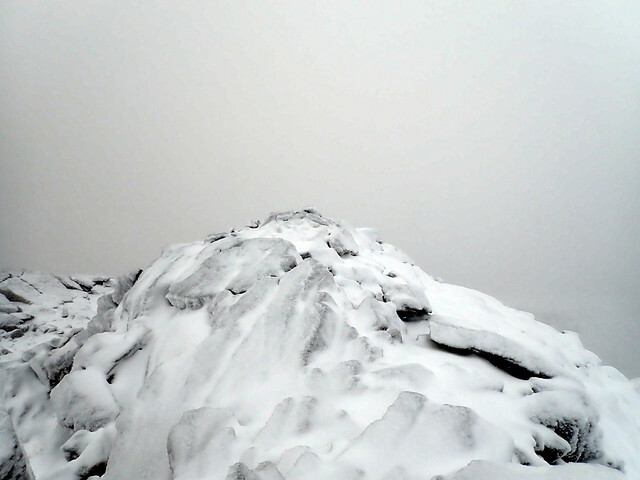 By the time it came to summit Ben More Assynt, a blizzard had whipped up from somewhere and it was quite unpleasant. Although I'd walked across without my crampons, I decided that the sureness of my footing would be improved on the return journey if I put them on, so stopped to do this. 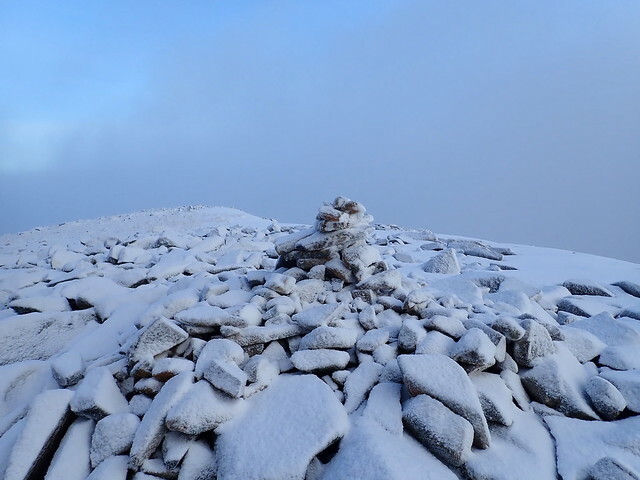 There was no shelter to have lunch, so I made it back to the cairn on Conival before eating. The weather continued to be quite unpleasant for the first part of the descent and I thought to myself that I might just head home today rather than have another wet night and claggy climb tomorrow. But then I dropped beneath the cloud layer, the rain stopped and I was undecided. I looked over at Breabag, thinking it would be nice to nip up there - although as it was nearly 2pm I knew there wasn't nearly enough light to do that. Another band of rain came across from the south as I was walking out and this decided me to head for home. Five hours later, much of the drive in the dark/rain, I was home, looking forward to the next visit to Assynt. weaselmaster wrote: As it happens, I had started my job as a consultant the day before the summer solstice of 1995, so there was some poetry in my concluding the day before the winter solstice. I started my Consultant job on April Fools day 1995! No serendipitous get-out from that one methinks ... however, I am sorely tempted to take a year's early retirement this summer (no headshrinkers retirement perks for us honest gasmen ), and the hills are largely responsible for me veering towards that option! my late father, also consultant gasman, would have recommended that course. Gave up at 59, did 4 years of five sessions a week - no Monday mornings, no Friday afternoon and NO ON-CALLS - he loved it...... Go for it! May I ask why you left Beinn Dearg to last on the round, most people and WH suggest going anti clockwise. What are the pros & cons in your opinion please. gammy leg walker wrote: May I ask why you left Beinn Dearg to last on the round, most people and WH suggest going anti clockwise. Hi - I left Beinn Dearg to last as I thought I might tag on the simm to its south - which i didn't do in the end. 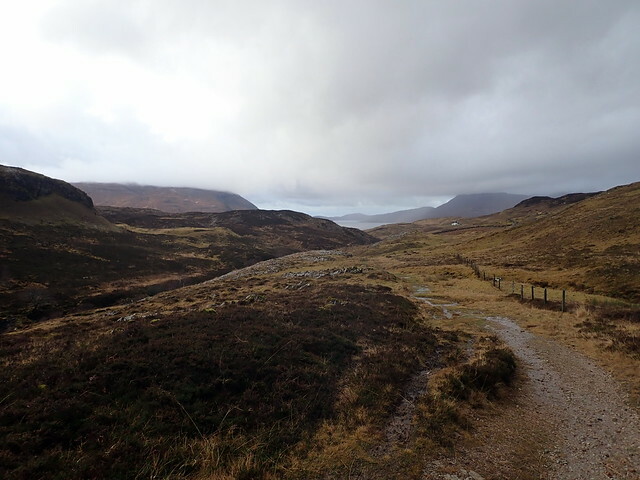 I can't think there's much difference in whether you do a clockwise or anticlockwise round - the track up to dearg is a bit better/clearer than the one to eididh nan clach geala, but there's little in it. 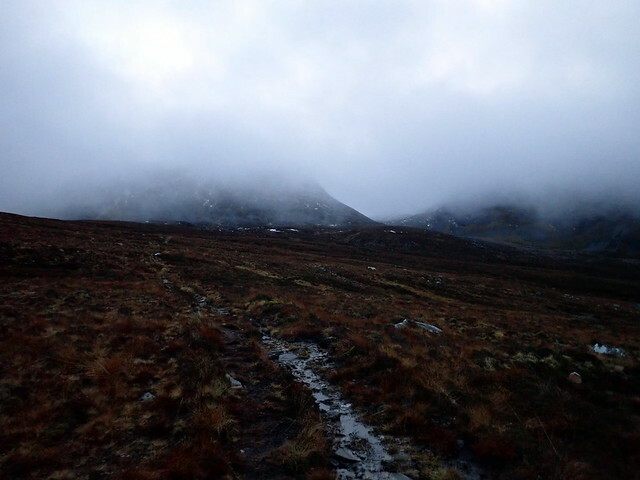 You have a bit more ascent on the final hill if you leave dearg til last. A great way to start your retirement, reminding one as it does that there's life outside work. I started mine the same way (actually with a WH meet in Snowdonia), and haven't regretted a moment. Mind you, due to changes in the strategic direction of the company I worked for, I was for the first time in my working life very hacked off with work for the last 18 months or so, and hence absolutely delighted to leave it for good. The main surprise about being retired is a retrospective sense of wonder: how on earth did I ever find time to work 60 hours a week???
" 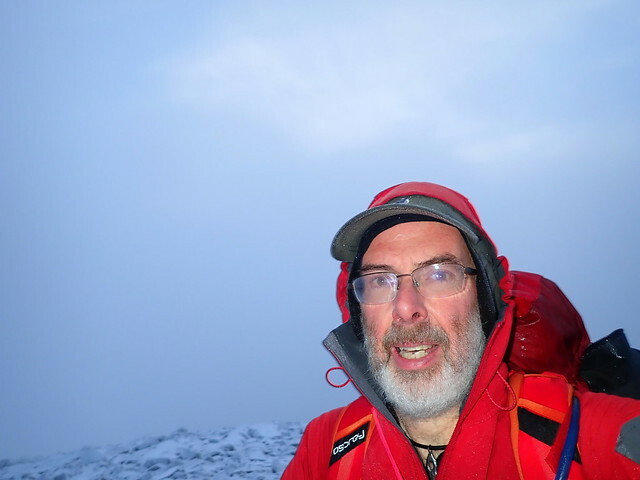 I decided to leave my rather heavy rucksack behind and ascend Cona'Mheall unladen - third time I've climbed this hill sackless"
Alteknacker wrote: A great way to start your retirement, reminding one as it does that there's life outside work.